Mobility rules the C-arm landscape, but other features are enhancing the technology's versatility. The mobile C-arm industry has made significant advancements in the past few years, both in terms of technology and applications. One trend has been a push from manufacturers concerning flat-panel detectors, which has upped the game for image quality and made C-arms more versatile for more procedures. 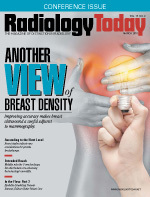 "Over the past couple of years, the biggest [trend] has been the introduction of C-arms with flat-panel detectors, which improves image quality and lowers dose [more effectively than] image intensifier technology," says Lisa Reid, director of surgery and urology segments at Siemens Healthineers. "We're also seeing a lot of interest in the 3D imaging that supports surgical navigation." Martin Ringholz, director of global marketing at Ziehm Imaging, says motorization continues to be a big trend, and there are other new features creating buzz in the segment. "C-arms are going more and more 3D and multidisciplinary; 3D intraoperative imaging reduces the need for postoperative CT scans, and we are seeing new applications run on mobile C-arms, eg, cochlear implantation," Ringholz says. "Dose saving and dose awareness is and will remain a hot topic in the C-arm industry, with more C-arms offering high image resolution at a minimal dose level. Finally, we will see more office-based lab [OBL] settings instead of exclusive use in hospitals." Dan Strauch, chief marketing officer of GE Healthcare Surgery, says it's been a busy year-and-a-half for GE surgery, as the company has revamped its entire product portfolio, including a new ergonomic C-arm that it showed at RSNA 2017. "The introduction of the first flat panels in the C-arm market two years ago has set this expectation around improved image quality, lower doses, and larger fields of view," Strauch says. "[But the] technology [that was being used] was basically taken from the fixed room and brought into the mobile space." To provide images comparable to a fixed environment in a mobile environment, GE Healthcare developed a new line and released its Elite CFD with CMOS flat panel technology. "It really meets the needs of a hospital, utilized for everything from orthopedics to cardiac," Strauch says. "What CMOS allows us to do is [take] all of the data that the detector captures [and] transmit it to the display. There is some software processing that enhances the imagery, but it's a true view of your image." Another feature GE customers have been asking for is customization, which is why, in 2017, the company introduced its OEC 1, an all-in-one system. In response to recent trends, Siemens Healthineers has introduced a completely new line of flat-panel detector C-arms. Reid says the company recently reintroduced its line of mobile C-arms, receiving FDA clearance for the Cios Select, Cios Connect, Cios Fusion, and the new version of the Cios Alpha. She notes that the latest version of the Cios Alpha mobile C-arm features a square flat-panel detector that helps users reach optimum levels of minimally invasive intervention in the modern surgical environment as well as revised software that delivers a large preview image and allows operating room staff to select appropriate image settings more easily. The Cios Fusion offers two detector sizes—30 cm X 30 cm and 20 cm X 20 cm—and has most of the same software and hardware features as the Cios Alpha, including a touchscreen remote that can be positioned at the operating table to control the C-arm from within the sterile work area. The Cios Connect mobile C-arm weighs just 547 lbs, enabling surgeons to perform a broad area of applications and allowing physicians to display individual images simultaneously in subtracted and X-ray views to optimize the presentation of contrast and bone while supporting a broad range of surgical needs. The entry-level Cios Select mobile C-arm includes a push-button interface for workflow and utilizes the image processing algorithm IDEAL (Intelligent Dose Efficiency Algorithm) to provide continuous contrast and brightness adjustments as well as the automatic dose-performance adjustment that is available across the entire Cios family. Siemens Healthineers also has Arcadis Orbic 3D C-arm and Cios Spin, which can provide health care facilities with dual 3D and 2D capabilities. Ziehm Imaging has seen revenue in the flat-panel segment significantly increase over the past few years, and the company is working on new solutions in this field. "Our CMOS line is now also available in a 31 cm X 31 cm variant on the full portfolio, allowing for more anatomical details or significantly less dose," Ringholz says. "Our 3D solutions combined with navigation are now also available with a larger field of view option for bigger coverage—19.8 cm X 19.6 cm X 18 cm volume. Our cochlear package with zoom-in function of the data set, which has a high resolution while allowing for a reduced dose level, supports the use of mobile C-arms in this new field of application." For cardiac and cardiovascular applications, Ringholz notes Ziehm's 2D C-arms with 20.5 cm X 20.5 cm CMOSline panel with rotating anode work best; for orthopedic, vascular, and extremities interventions, its 2D C-arms with 31 cm X 31 cm CMOSline panel with rotating anode should be used. "For specialized orthopedic and trauma applications in 3D, also in combination with surgical navigation, our 3D C-arms with 31 cm X 31 cm CMOSline panel for optimized visualization is recommended," Ringholz says. "Generally speaking, our CMOSline is ideally suited for most demanding applications and also for dose-sensitive applications, eg, in pediatrics." With mobile C-arms, Reid says, hospitals have a tendency to keep them around 8 to 10 years, but now is the right time to transition. "There's only so much you can do, but by putting the flat-panel detectors on these—one of the last modalities to have them—it is a big advancement for the mobile C-arm," she says. Reid notes that the 3D C-arms are primarily utilized in hospital settings for maxillofacial surgery and spine surgery, but other types of facilities are starting to use them for trauma and other conditions. Many companies that make surgical navigation equipment are networked with the C-arms, and their equipment is utilized with the C-arms during surgeries. Tracy Storz, marketing administrator for Biodex Medical Systems, Inc, notes that motion capabilities in surgical C-arm tables are being explored for improving image quality and simplifying the imaging process. "We incorporated isocentric lateral roll movement into our newly enhanced surgical C-arm tables," Storz says. "This unique movement maintains the center of the focal area, minimizing image distortion [and reducing] exposure to scatter radiation." Ringholz says the latest STILLE imagiQ2 low-dose enabler, designed for image-guided endovascular procedures, is compatible with Ziehm Vision RFD Hybrid Edition CMOSline. "The imagiQ2 surgical imaging table is optimized for advanced mobile hybrid [operating room] procedures as well as more conventional office-based endovascular repair," Ringholz says. "The high-performance carbon fiber table top provides at least 60% more translucency than the average imaging tabletop translucency on the market. This enables the C-arm to reduce dose without compromising image quality." When it comes to tables, Storz says the next step for C-arms is digital communication with imaging tables via software enhancements. "When C-arms and tables can 'talk' to each other, movement will be integrated and automatic—much like a self-driving car," she says. "This will help further simplify positioning during procedures, prevent damage to tables, and keep the C-arm from touching the patient." In the next decade, Ringholz believes the industry will see more use of mobile C-arms in the growing segment of OBL settings. "A growing number of high-end mobile C-arms will feature CMOS detector technology, and there will be stronger differentiation in the high-end and midrange segment with features like 3D and motorization," he says. "We will also see more low-dose solutions and more dose sensitiveness and awareness on the customer side. Finally, the price pressure in the low-end C-arm market segment will continue to increase." Reid says the biggest impact she sees in the future relates more to how the current equipment will be used. "If you look at the market right now for surgery, a lot of things are moving to the outpatient setting. The Centers for Medicare & Medicaid Services are approving more reimbursements for more procedures—things like knee and hip replacements or vascular procedures—so I think this will likely grow the market for C-arms," she says. "It's easy to put a mobile C-arm in this setting and the image quality on the flat-panel detector makes it very viable."